Pam8610 IC is 10 watts @ 8 ohms (15 watts @ 4 ohms small heat sink require) stereo class d amplifier with very high efficiency over 90% and the amplifier works well without any heat sink at full power!!! . The amplifier board is very low cost ( around 1 $) but deliver 10 watts @ 8 ohms power from 13 volts power supply. The amplifier sound good with good bass respond good bass impact and well control (kick bass very good). High frequency clean, impact well and flat but lack transparent. Singer vocal is clean but not transparent. The sound stage is wide but space between instrument not precise. pam 8610 amp board is the quiet amp with very less hiss noise (5 cm away from tweeter to my ear :) which is not a big problem at all and the amp do not oscillate with 1.5 meters speaker wire, not like some class d board amp. See sound test with JVC loudspeaker. The amplifier board is very tiny 1"x1"dimension. How should I use this one with 4ohms speakers? Thank you. Note: 3. Heat sink is required for high power output. Does It matter if I chose a 50v 100 uf electrolytic capacitor or a 35v model. Or is a noteer model needed? 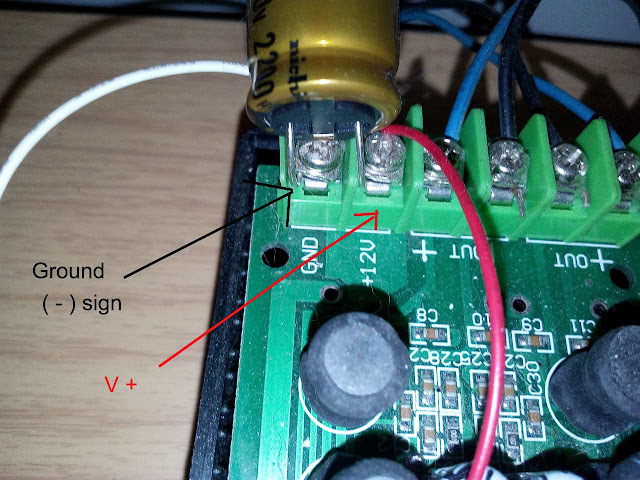 If you feed the pam8610 board with 12 volts dc, you need capacitor voltage value at least 16 volts. Using high voltage rate capacitor doesn't effect sound quality and make the cap's life longer but the higher voltage model cost is higher. how many ampere of your adaptor? Normally, if you play loud music with deep bass with low impedance loudspeaker, you amplifier work hard and may activate built-in thermal protection. I am also having the same problem.. whenever i try to increase my volume its goes off and then restars itself.. why is this happening. 1 Don't boost bass too much. 3 Sometimes, the Pam 8610 ic design board has poor heating transfer performance or not pass qc. 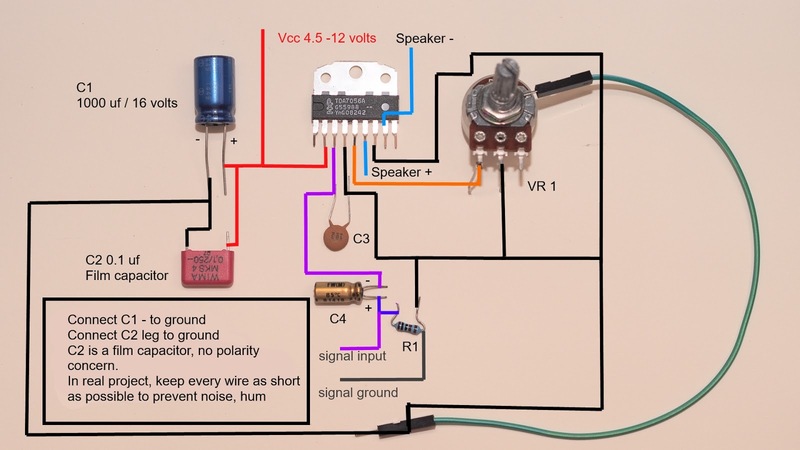 This bass boost diagram is easy to build and work well, I made it because people asked me the schematic diagram of bass boost diagram on my youtube channel. The circuit has 9 dB gain@40 Hz that mean you will get good bass performance even you play music to a small speaker. Why this circuit doesn't look like circuits on the internet? Almost every circuit on the internet uses R/C filter between pre-amp and power amp stage to bypass high frequency to a ground and that seems audio signal being amplified and bypass to ground. I think it wastes pre-amplifier gain, the more gain preamp stage the more distortion to the audio signal, so I use a capacitor to send more negative feedback to pre-amp negative input when the frequency higher than cut-off frequency, capacitor impedance(resistance) higher when frequency lower and that make negative feedback decrease when frequency lower. Hall effect sensor switch is a switch that turns on when enough magnetic field near the IC. 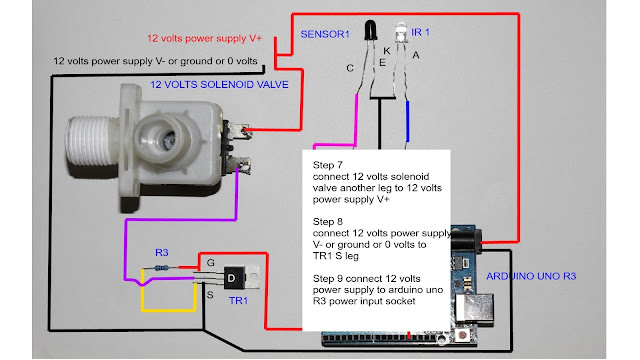 You can use hall effect sensor to make many Diy projects such as rpm meter, magnet detector, and more project involves with a magnet. Did you know? 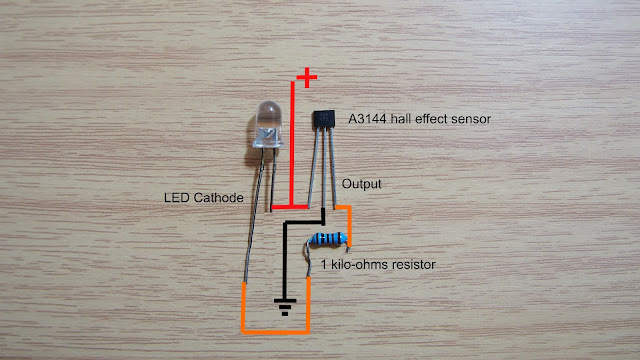 Hall effect sensor uses in many electric machines, example; when you open washing machine door and the machine stop spinning, or when you open microwave door then it pauses and send beeping sound until you close the door. 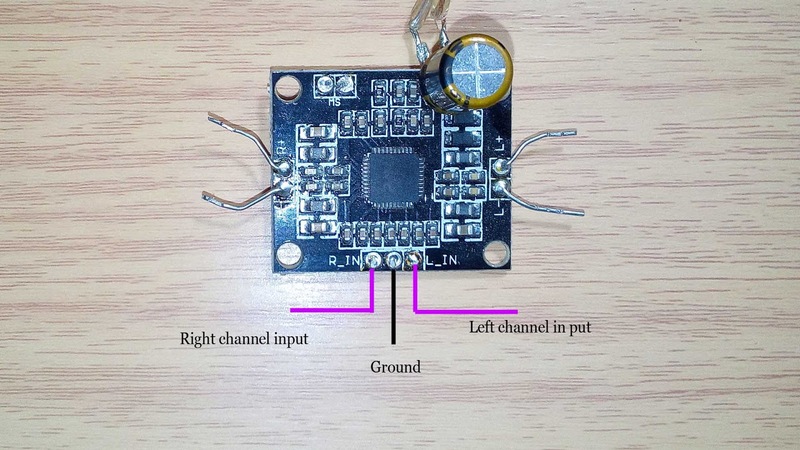 Hall effect sensor IC in this post is A3144(old component but work well and low cost) Send output low (0 volts) when strong magnetic field near a sensor, that why somebody asked on the internet why his project involves hall effect sensor didn't work. 1. 2 to 10 kilo-ohms resistor 2. 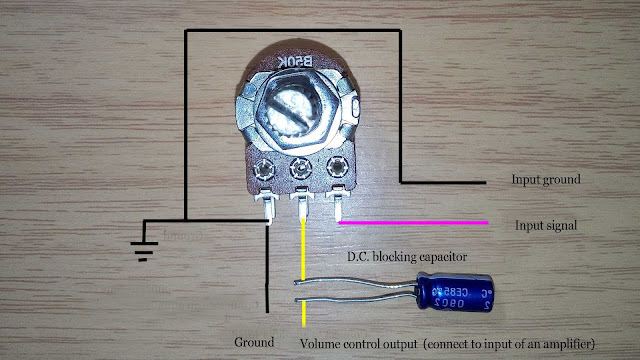 Capacitor uses to blocking dc current to preamplifier See picture below for better understand. 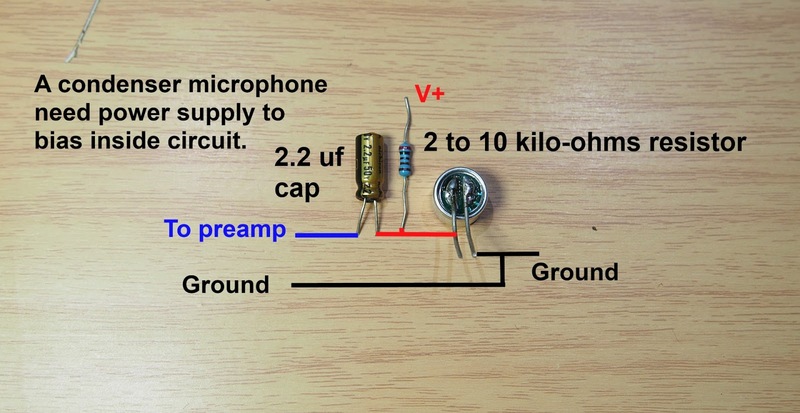 However, an output signal from the microphone is very small and need to amplify with any preamplifier before connecting to amplifier board. Now, let's start making and preamplifier. 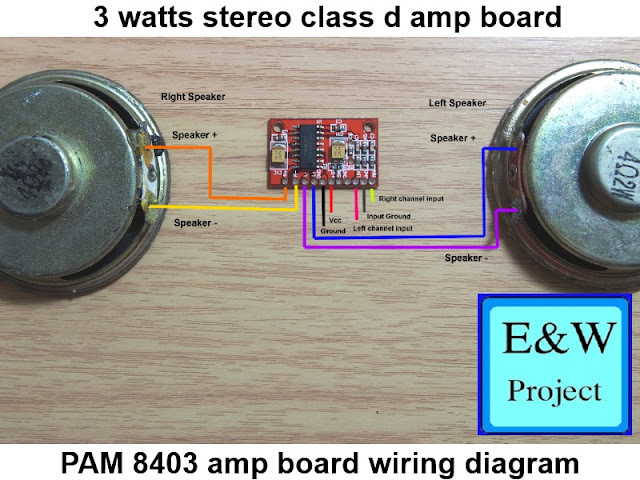 3 watts stereo amp board pam8403 sound test with jvc loudspeaker. PAM 8403 is a class d integrated amplifier that sounds good and energy efficiency. The ic requires only 5 volts for full 3 watts stereo (2 amperes 5 volts power supply need for full power) with 83 % efficiency @ 4 ohms load, so this amp board is good for battery power. The amplifier board work well with 1-metre speaker cable so this amp is very stable and no need big power supply filter capacitor to eliminate hum from a power supply (Bass respond will be better if you add 2200 uf/16 volts electrolytic capacitor parallel to power supply filter.Make sure you connect electrolytic capacitor with correct polarity!!! or ka-boom.